As Allied troops moved across Europe, they began to encounter and liberate concentration camps. Soviet forces were the first to approach a major Nazi camp, reaching Majdanek near Lublin, Poland, in July 1944. Surprised by the rapid Soviet advance, the Germans attempted to demolish the camp in an effort to hide the evidence of mass murder. 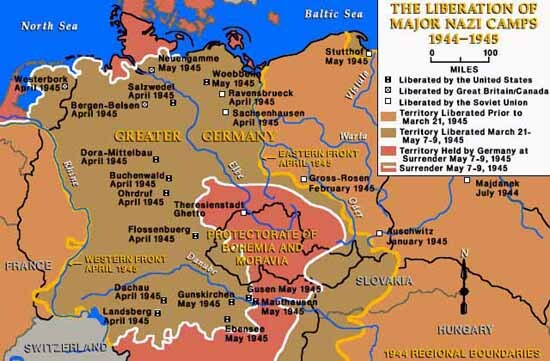 The Soviets also liberated Auschwitz, Stutthof, Sachsenhausen, and Ravensbrueck. U.S. forces liberated Buchenwald, Dora-Mittelbau, Flossenbuerg, Dachau and Mauthausen. British forces liberated camps in northern Germany, including Neuengamme and Bergen-Belsen.